Renae is married with 6 children who keep her busy being involved in sports such as hockey, soccer, cross country and volleyball. Renae graduated in 1996 with her Associates Degree in Physical Therapy and has been practicing in the field for 22 years. 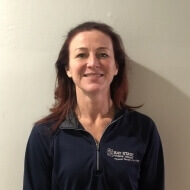 She has extensive experience treating a varied patient population including orthopedics, pediatrics, geriatrics and athletes looking to return to sport.